It’s a kill or be killed world under water and the most aggressive alpha predators live in the bluewater abyss. Everything moves fast past 50 fathoms, and vertical jigging is the name of the game in the deep. 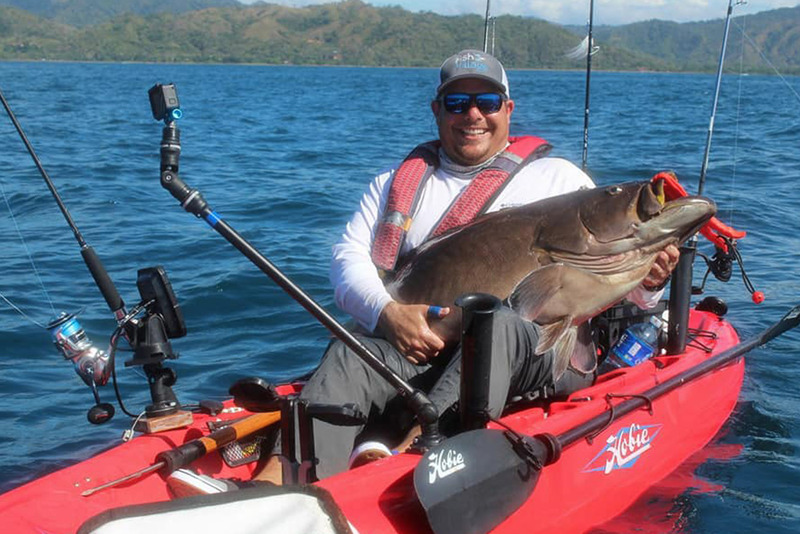 Adam Fisk is manager of operations at Los Buzos resort in Panama, a standout in the Extreme Kayak Fishing Tournament and a flutter jig aficionado. Glow-in-the-dark jigs work best in deep water where there is little light. A glowing jig resembles a squid, just about every fish’s favorite food. To target bottom fish, drop the jig to the bottom, pop it up and let it sink.If it doesn’t get hit, quickly bring it up to mid-water column, then drop it back down and repeat. Sometimes big fish hit when the jig starts moving to the surface. For bottom dwellers like grouper and snapper, use heavy 100-pound leader and 80-pound braided line to put maximum pressure on the fish. As soon as a grouper hits, crank hard and apply heavy drag to turn the fish’s head toward the surface. Get the fish away from the rocks in the first 10 seconds. When targeting wahoo, keep the rod top steady and reel fast. A pause in the retrieve increases the odds the wahoo will strike above the jig and snap the line. Use light, 40-pound fluorocarbon leader for sharp-sighted tuna and wahoo. The best jigging rod is six-feet, six inches long. 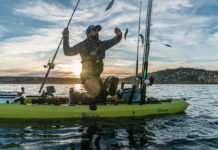 A shorter rod makes it easier to quickly work the jig, but kayak anglers need a longer rod to maneuver the fish around the bow. Use a two-speed reel with a gear ratio of 3:1 to overpower a charging tuna and high speed at 6:1 to work the jig. A Bimini twist to reverse Albright connects leader to line with a strong, low-profile knot passing smoothly through rod guides. If the bite is slow with the larger jigs, try something smaller. Sometimes fish are feeding on very small glass minnows and will not hit a big lure. 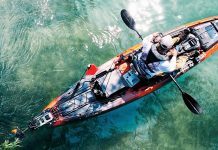 Pitch the jig into the current before you start to drift so it is directly below the kayak when it hits bottom. Always fish directly over the jig, working it vertically to the surface.